Fyodor Dostoevsky (November 11, 1821 – February 9, 1881) was a Russian writer. His works have had a profound and lasting effect on twentieth-century literature. Dostoevsky often portrayed characters living in poor conditions with equally disparate and troubled states of mind. This allowed him to explore human psychology in the political, social and spiritual context of 19th Century Russian society. Some scholars consider him the founder of existentialism. 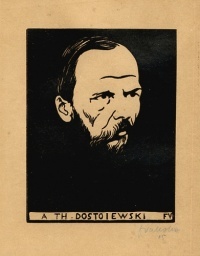 Philosopher Walter Kaufmann called Dostoevsky's Notes from Underground "best overture for existentialism ever written." (1876) "The Heavenly Christmas Tree"
Unless indicated otherwise, the text in this article is either based on Wikipedia article "Fyodor Dostoevsky" or another language Wikipedia page thereof used under the terms of the GNU Free Documentation License; or on original research by Jahsonic and friends. See Art and Popular Culture's copyright notice.